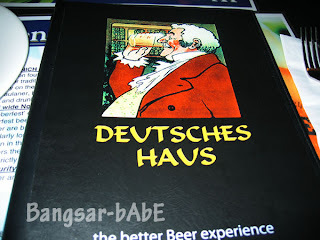 For our anniversary dinner, rif took me to Deutsches Haus at Changkat Bukit Bintang. He has been raving about the pork knuckles there. We got there around 8.30pm and only 2 tables were occupied. For starters, we had the Pork Shoulder Salad and Garlic Bread. 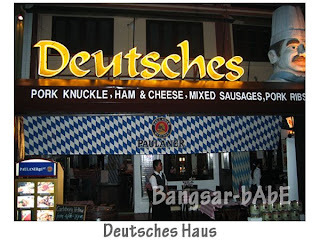 We decided to order the Deutsches Haus Combo to share. 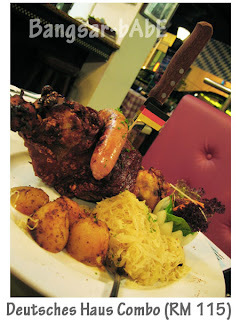 The combo consisted of a pork knuckle with German sausage, boiled potatoes, sauerkraut and mustard. 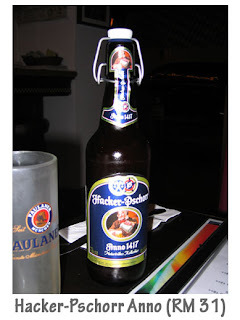 Since I didn’t want any Paulaner, we tried their Hacker-Pschorr Anno 1417. 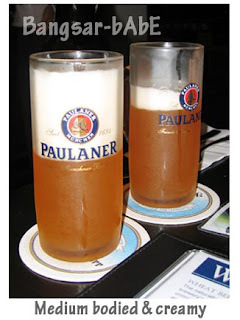 A nice hue of pale amber, this unfiltered lager was pretty good and frothy (pardon the Paulaner mugs). With a good balance of flavours (malt, nuts & fruit), it was medium-bodied and had a slightly “grainy” but creamy feel. The malty taste lingered long after the beer is gone. Very nice indeed! The salad was alright. 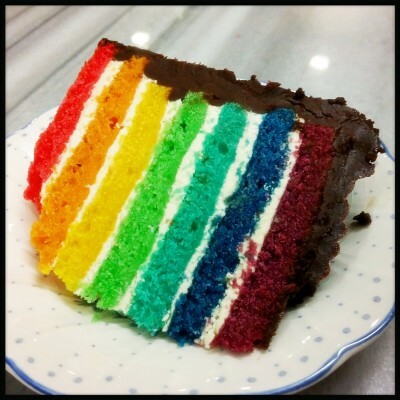 I thought it was a rather small portion. The pork pieces were juicy and very tender. With a thin layer of fats between the meat, the salad dressing accompanied it beautifully. 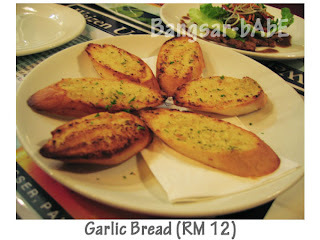 The garlic bread was average, great for mopping up the tangy salad dressing. The highlight of the meal was the Pork Knuckle. It was HUGE. The sausage was juicy and had a wholesome meaty texture, though I would have preferred weissewurst. The pork knuckle was delicious. 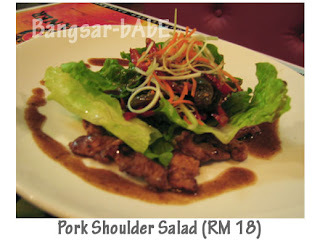 Its crispy skin reveals a mouth-watering chunk of tender pork flesh with a layer of melt-in-your-mouth fats. As the waiter cuts the knuckle for us, we could hear sounds of crackling from the pork skin. Some parts of the skin were not as crispy, presumably because they did not salt it properly or roast it enough. 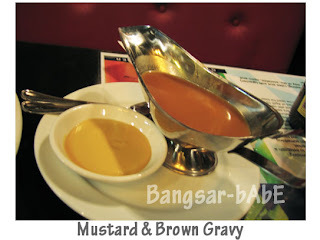 The pork knuckle was served with some mustard and piquant brown gravy. The tinge of sourness helped balance the rich meat. The sauerkraut was tantalizing, very nice indeed and the boiled potatoes were also quite good. We didn’t have desserts as I didn’t think they do good strudels. Their strudels looked very much like the ones we had in Vienna, which I didn’t like one bit. 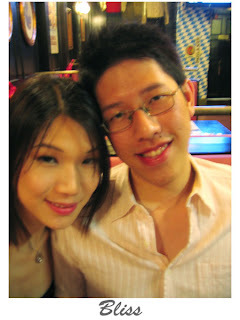 The bill came up to RM 208.15 (inclusive of 5% tax and 10% service charge) for the 2 of us. Expensive, but the food was great. Thanks for dinner rif! Verdict: Good food, great beer. 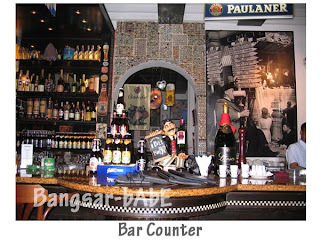 Try the pork knuckle, sausage platter and their variety of beers. well i thought the pork knuckle was good despite your comment about the skin. i think that you felt that some parts of the skin was not crispy because when you roast meat, it tends to shrink, so the part which you “thought” was skin was actually meat. Parts of the skin was chewy. I still stand by my verdict.